Eucalyptus nitens is a fast growing plantation species that has a good acclimation in Chile. It is commonly used for pulp and paper, but there is a growing market for solid wood products made from this species and an interest on producing high quality material. Thermal modification technology have been used to obtain high quality product out of fast growing plantation species. In this study we modified Eucalyptus nitens to analyse the influences of the process conditions and evaluated its mechanical properties under several process conditions. The material was modified in a closed system under elevated pressure and controlled relative humidity (30 and 100% relative humidity) at temperatures between 150 and 170°C, and in an open system with a standard thermal modification procedure between 160 and 230°C. Modulus of elasticity, modulus of rupture, deflection and work in bending (in elastic and inelastic proportions) and the resistance to impact milling in high energy multiple impact tests were determined. Mass loss after each modification was also measured and correlated with the mechanical properties. Anatomical properties of selected modifications were analysed. There were no significant differences between open and closed system modifications in both mechanical and anatomical properties. ALEN, R.; KOTILAINEN, R.; ZAMAN, A. 2002. Thermochemical behavior of Norway spruce (Picea abies) at 180-225 degrees C. Wood Science and Technology 36 (2):163-171. ALLEGRETTI, O.; BRUNETTI, M.; CUCCUI, I.; FERRARI, S.; NOCETTI, M.; TERZIEV, N. 2012. Thermo-vacuum modification of spruce (Picea abies Karst.) and fir (Abies alba mill.) wood. BioResources 7 (3):3656-3669. ALTGEN, M.; MILITZ, H. 2016. Influence of process conditions on hygroscopicity and mechanical properties of European beech thermally modified in a high-pressure reactor system. Holzforschung 70 (10):971-979. ALTGEN, M.; WILLEMS, W.; MILITZ, H. 2016. Wood degradation affected by process conditions during thermal modification of European beech in a high-pressure reactor system. European Journal of Wood and Wood Products 74 (5):653-662. AWOYEMI, L.; JONES, I.P. 2011. Anatomical explanations for the changes in properties of western red cedar (Thuja plicata) wood during heat treatment. Wood Science and Technology 45 (2):261-267. BATISTA, D.C.; PAES, J.B.; BOLZÓN-DE MUÑIZ, G.I. ; NISGOSKI, S.; DA SILVA- OLIVEIRA, J.T. 2015. Microstructural aspects of thermally modified Eucalyptus grandis wood. Maderas-Cienc Tecnol 17(3):525-532. BIZIKS, V.; ANDERSONS, B.; BELKOVA, L.; KAPACA, E.; MILITZ, H. 2013. Changes in the microstructure of birch wood after hydrothermal treatment. Wood Science and Technology 47 (4):717-735. BOONSTRA, M. J.; RIJSDIJK, J.F. ; SANDER, C.; KEGEL, E.; TJEERDSMA, B.; MILITZ, H.; VAN ACKER, J.; STEVENS, M. 2006a. Microstructural and physical aspects of heat treated wood. Part 1. Softwoods. Maderas-Cienc Tecnol 8 (3):193-208. BOONSTRA, M.J.; RIJSDIJK, J.F. ; SANDER, C.; KEGEL, E.; TJEERDSMA, B.; MILITZ, H.; VAN ACKER, J.; STEVENS, M. 2006b. Microstructural and physical aspects of heat treated wood: Part 2. Hardwoods. Maderas-Cienc Tecnol 8 (3):209-218. BOONSTRA, M.J.; TJEERDSMA, B. 2006. Chemical analysis of heat treated softwoods. Holz Als Roh-Und Werkstoff 64 (3):204-211. BOONSTRA, M.J.; VAN ACKER, J.; KEGEL, E.; STEVENS, M. 2007. Optimisation of a two-stage heat treatment process: durability aspects. Wood Science and Technology 41 (1):31-57. BORREGA, M.; KÄRENLAMPI, P. 2008. Mechanical behavior of heat-treated spruce (Picea abies) wood at constant moisture content and ambient humidity. Holz Als Roh-und Werkstoff 66 (1):63-69. BRISCHKE, C. 2017. Interrelationship between static and dynamic strength properties of wood and its structural integrity. Drvna Industrija 68 (1):53-60. BRISCHKE, C.; RAPP, A.O. ; WELZBACHER, C.R. 2006a. High-energy multiple impact (HEMI)–test–Part 1: A new tool for quality control of thermally modified timber. Proceedings of the 37th annual meeting of The International Research Group on Wood Preservation. Document No 06-20346 IRG/WP. BRISCHKE, C.; WELZBACHER, C.R. ; RAPP, A.O. 2006b. Detection of fungal decay by high-energy multiple impact (HEMI) testing. Holzforschung 60 (2):217-222. DAGBRO, O.; TORIAINEN, P.; KARLSSON, O.; MORÉN, T. 2010. Colour responses from wood, thermally modified in superheated steam and pressurized steam atmospheres. Wood Material Science and Engineering 5 (3-4):211-219. DE CADEMARTORI, P.H.G. ; MISSIO, A.L. ; MATTOS, B.D. ; GATTO, D.A. 2015. Effect of thermal treatments on technological properties of wood from two Eucalyptus species. Anais da Academia Brasileira de Ciências 87 (1):471-481. DIN 52186. 1978. Testing of wood: bending test. German Institute for Standardisation, Berlin. ESTEVES, B.; PEREIRA, H. 2009. Wood modification by heat treatment: a review. BioResources 4 (1):370-404. HAKKOU, M.; PÉTRISSANS, M.; GÉRARDIN, P.; ZOULALIAN, A. 2006. Investigations of the reasons for fungal durability of heat-treated beech wood. Polymer Degradation and Stability 91 (2):393-397. HILL, C.A.S. 2006. Wood Modification: Chemical, Thermal and Other Processes. John Wiley & Sons, Ltd., West Sussex, England. KUBOJIMA, Y.; OKANO, T.; OHTA, M. 2000. Bending strength and toughness of heat-treated wood. Journal of Wood Science 46 (1):8-15. LEKOUNOUGOU, S.; KOCAEFE, D.; OUMAROU, N.; KOCAEFE, Y.; PONCSAK, S. 2011. Effect of thermal modification on mechanical properties of Canadian white birch (Betula papyrifera). International Wood Products Journal 2 (2):101-107. MAYES, D.; OKSANEN, O. 2002. ThermoWood Handbook. Finnish Thermowood Association, Helsinki, Finland. MILITZ, H.; ALTGEN, M. 2014. Processes and properties of thermally modified wood manufactured in Europe. In: SCHULTZ T.P., GOODELL B., NICHOLAS D.D. (eds) Deterioration and protection of sustainable biomaterials. ACS Symposium Series 1158. Oxford University Press, pp 269-285. PHUONG, L.X. ; SHIDA, S.; SAITO, Y. 2007. Effects of heat treatment on brittleness of Styrax tonkinensis wood. Journal of Wood Science 53 (3):181-186. PONCSÁK, S.; KOCAEFE, D.; BOUAZARA, M.; PICHETTE, A. 2006. Effect of high temperature treatment on the mechanical properties of birch (Betula papyrifera). Wood Science and Technology 40 (8):647-663. RAPP, A.O. ; BRISCHKE, C.; WELZBACHER, C.R. 2006. Interrelationship between the severity of heat treatments and sieve fractions after impact ball milling: a mechanical test for quality control of thermally modified wood. Holzforschung 60 (1):64-70. RAUTKARI, L.; HILL, C.A.S. 2014. Effect of initial moisture content on the anti-swelling efficiency of thermally modified Scots pine sapwood treated in a high-pressure reactor under saturated steam. Holzforschung 68 (3):323-326. SANTOS, J.A. 2000. Mechanical behaviour of Eucalyptus wood modified by heat. Wood Science and Technology 34 (1):39-43. SUNDQVIST, B.; KARLSSON, O.; WESTERMARK, U. 2006. Determination of formic-acid and acetic acid concentrations formed during hydrothermal treatment of birch wood and its relation to colour, strength and hardness. Wood Science and Technology 40 (7):549. TAPPI. 1997. Solvent extractives of wood and pulp. Test method T 204 cm-07. Technical Association of the Pulp and Paper Industry, Atlanta, GA.
TJEERDSMA, B.F.; BOONSTRA, M.; PIZZI, A.; TEKELY, P.; MILITZ, H. 1998. Characterisation of thermally modified wood: molecular reasons for wood performance improvement. Holz Als Roh-Und Werkstoff 56 (3):149-153. TJEERDSMA, B.F.; MILITZ, H. 2005. Chemical changes in hydrothermal treated wood: FTIR analysis of combined hydrothermal and dry heat-treated wood. Holz Als Roh-Und Werkstoff 63 (2):102-111. WEIGL, M.; MULLER, U.; WIMMER, R.; HANSMANN, C. 2012. Ammonia vs. thermally modified timber-comparison of physical and mechanical properties. European Journal of Wood and Wood Products 70 (1-3):233-239. WELZBACHER, C.R. ; BRISCHKE, C.; RAPP, A.O. 2007. Influence of treatment temperature and duration on selected biological, mechanical, physical and optical properties of thermally modified timber. Wood Material Science and Engineering 2 (2):66-76. WELZBACHER, C.R. ; RASSAM, G.; TALAEI, A.; BRISCHKE, C. 2011. Microstructure, strength and structural integrity of heat-treated beech and spruce wood. 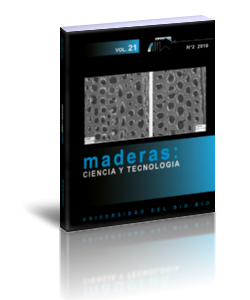 Wood Material Science & Engineering 6 (4):219-227. WENTZEL, M.; ALTGEN, M.; MILITZ, H. 2018a. Analyzing reversible changes in hygroscopicity of thermally modified eucalypt wood from open and closed reactor systems. Wood Science and Technology 52(4): 889-907. WENTZEL, M.; FLECKENSTEIN, M.; HOFMANN, T.; MILITZ, H. 2018b. Relation of chemical and mechanical properties of Eucalyptus nitens wood thermally modified in open and closed systems. Wood Material Science & Engineering (published online) DOI: https://doi.org/10.1080/17480272.2018.1450783. WILLEMS, W. 2009. A novel economic large-scale production technology for highquality thermally modified wood. Proceedings of the 4th European Conference on Wood Modification, Stockholm, Sweden. WINANDY, J.E. ; LEBOW, P.K. 2001. Modeling strength loss in wood by chemical composition. Part I. An individual component model for southern pine. Wood and Fiber Science 33 (2):239-254. ZAMAN, A.; ALEN, R.; KOTILAINEN, R. 2000. Thermal behavior of scots pine (Pinus sylvestris) and silver birch (Betula pendula) at 200-230 degrees °C. Wood and Fiber Science 32 (2):138-143.